We arrived back home from conference around 2:30 pm. Plenty of time left in the afternoon...none of it for napping...well, Justin got his nap. Amelia and I went outside and enjoyed the 78 degree weather and sunshine. I filled a bowl of water and her little water can full. She amused herself for over an hour playing with the water. She watered my tomatoes, tried to water her caterpillar toy, and definitely watered herself. I amused myself by taking tons of pictures! 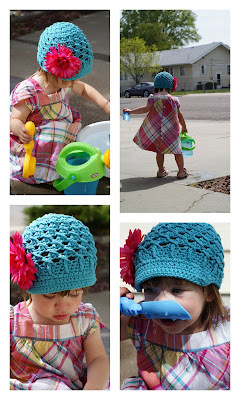 She wore a totally cute new outfit today with a bright blue hat. It was irresistible. LOL! While I talked on the phone with Miekka we enjoyed four popsicles. Super DELICIOUS! LOL! 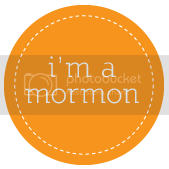 We had Stake Conference this weekend. We belong the the Cheyenne, WY stake so made the trip on Saturday and stayed the night in a hotel. It was a nice get-away! Justin got up early Saturday to shoot some Prairie Dogs with Matt (Alison's hubby). He actually shot two dogs AND inspected the damage. I got up early as well to check out a garage sale the street over. I ended up buying another crib. This one coverts into a toddler bed and then into a twin. We will use it for Amelia once the baby is born. I have the feeling she may give up naps if I take her out of the crib too early. Naps are golden. I also scored some fun infant boy clothes at the same sale. We left for Cheyenne around 11:30. Our goal was to get to the hotel in time for swimming before the Priesthood/leadership meeting. We grabbed some lunch before getting on the freeway. Swimming in the pool was so fun. Amelia is at the age when water is really intriguing. She begs to have her swim suit on all the time. To have a pool bigger than the bathtub was quite delightful, plus a hot tub put her over the top. 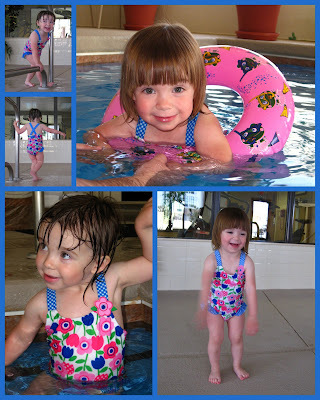 She ran from one pool to the other with great enthusiasm! I am so glad she caught on to using the inner tube without slipping through the ring. I will upload some video soon of her swimming. While Justin and Matt went to priesthood session, Alison, the kids, and I did a little shopping. We stopped at a second-hand kids clothing store. I found a ton of cute clothes and shoes for the little one and a fun caterpillar trike for Amelia. Next we went to Hobby Lobby for a couple items. Those two stores took all of our time! Alison made a quick stop at Big Lots before we headed back to the Stake Center. The RS provided a simple dinner of sandwiches and soup between Priesthood and the Adult sessions. It was much easier to attend the adult session when you drive so far!! Amelia did not appreciate the nursery after about an hour. It was nearing bedtime so she was a bit cranky. One thing that stuck with me from the session was a quote that went something like this: "Casualness leads to Casualties." In this day and age it is so easy to be casual in our dress, language, demeanor, etc that this quip rang true. Afterwards we went to Target for a couple minutes than back to the hotel. Amelia fainted after bonking her head on the bed's headboard. She was so tired afterwards! I was so relieved she slept in the hotel crib without a fuss. Maybe this means our struggles with foreign sleeping arrangements are becoming better. Next door a little boy cried for about an hour before he finally went to sleep...I was glad it was NOT Amelia. This morning we went to Stake Conference. We arrived about 40 minutes early to get decent seats. We ended up choosing the RS room for comfy seats and better accommodated for an active little girl. Amelia ran outside on the church lawn for 30 minutes. She was roaring like a lion saying, "scary Mia!" She must have worn herself out because she fell asleep on the drive home in apparent comfort! We were not as prepared come Sunday afternoon in the food department. Next time we will think to pack a lunch. So we stopped at Chipotle's before driving back home!! It was yummy, probably not as yummy due to being the Sabbath. I had a couple orders this week from a gal here in Sidney. I forgot to photograph one of the shirts, it was an initial shirt for a little girl named Victoria. Like a goober I messed up an order on Etsy already by switching two orders. I made the lady another hat, she ordered one hat but got a shirt instead. Luckily, she is a vendor too on Etsy so quickly mailed back the shirt and I whipped up two new hats and popped them in the mail on Friday. Geesh...I must be pregnant. 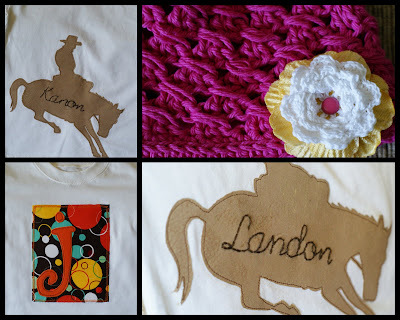 I think the horse shirts turned out pretty cute. Alison invited me over Thursday evening for some crafting. She made the cutest hibiscus shirt ever...you may see one of those shortly...if I can find the right colored shirt. We all had fun gabbing about this and that. Thanks Justin for the night off!! !